Ade Patience can see the future. Pretty cool, right? But there's one small problem. During his latest vision, he sees himself murdering a classmate from his high school. When 17-year-old Ade Patience knocks himself unconscious, he can see the future. However, he's also addicted to the high he gets when he breaks the laws of physics. And while he's seen things he's wanted to change, Ade knows The Rule: You can't change the future, no matter how hard you try. His emmory is failing, his grades are in a death spiral, and both Ade's best friend and his shrink are begging him to stop before he kills himself. Luckily, the stunning Vauxhall Rodolgo recently transferred to his school and, just like Ade saw in a vision two years previously, they're destined to fall in love. It's just the motivation Ade needs to kick his habit. Only . . . things are a bit more complicated than that. Vauxhall has a powerful addiction of her own. And after a vision in which Ade sees himself murdering someone, he realizes that he must break the one rule he's been told he can't. Ade and Vauxhall must overcome their addictions and embrace their love for each other in order to do the impossible: change the future. 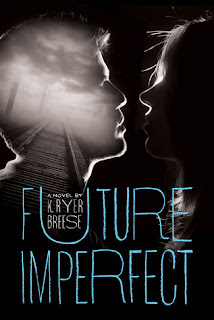 Future Imperfect melds the excitement of a classic Marvel Comics hero with the modern romance of Twilight, and the result is a genre-bending Young Adult tour-de-force. The premise for this novel was intriguing, but Future Imperfect just didn't deliver. It was too easy to get caught up in Ade's addiction to seeing the future - by somehow getting a concussion, whether through his own actions or provoking someone else. Vauxhall was an incredibly difficult character to like. And let's not forget Ade's mother, the super Jesus freak who now only approves of her son concussing himself to see the future but encourages it! This was a disjointed read, and every aspect failed to grab my attention and sympathy. Not recommended.